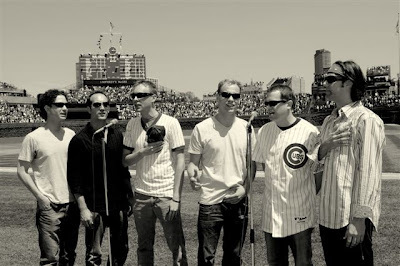 It's official: Umphrey's McGee is now our favorite band. This Chicago-based band has been in our top five for a few years now, but they've finally grabbed the lead with their recent mind-crusher of a show in Memphis. 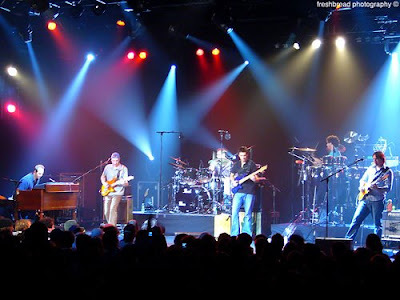 According to Wikipedia: "Though the band's approach to their live performances has much in common with Phish and the Grateful Dead (ever-changing setlists, constant improvisation, two sets per night, open-taping policy), they are much more influenced musically by progressive rock bands such as King Crimson, Yes, Pink Floyd, Dream Theater, Frank Zappa, and Genesis, as well as heavy metal bands such as Iron Maiden. The band also identifies The Police, The Beatles, and Led Zeppelin as primary influences." A highlight of any Umphrey's show is when Jake and Brendan face off in a guitar duel. This can happen in just about any song, but usually just once or twice a show. It's funny to see the soloists lean toward each other during their respective solos, and then lean back while the other one is soloing. These guys definitely like to ham it up sometimes! Some of the Memphis fans were hamming it up too! At one point near the end of the show, the band gave these guys props for still wearing the imperial helmets. The show was our first in the spacious new Minglewood Hall, located in the up-and-coming local entertainment scene in the Midtown area of Memphis, away from all the tourist craziness of Beale Street. Here you can read an article about how the hall was named after the famous song "New Minglewood Blues" that the Grateful Dead used to cover, and about how the president of the company that launched the venue used to sell grilled cheese sandwiches at Dead shows. They definitely put a lot of money into this place, and it was quite comfortable with ample bar space, enormous bathrooms and the latest technology in LED concert-hall lighting. The capacity is listed at 1500 people, but it seemed like they could get up to 2000 people in here if they wanted to. The show started off with a bang...literally...as they hammered us a few times with the one-chord opening to "All in Time". Possibly their quintessential song, "All in Time" has it all, with catchy pop-rock melodies set to Iron Maiden-style guitar harmonics and a frantic tempo, interspersed with crushing Metallica-style riffs in the chorus, and a huge jam section in the middle. This time they never returned from the jam section (the reprise would come at the end of the show), and after several manic crescendos of the "All in Time" jam, they veered into "The Fussy Dutchman", one of their bristling classical-prog instrumental pieces. By the time "Fussy Dutchman" slammed to an end, the crowd was fully whipped into a frenzy. Next up was "Rocker part II", one of their darker pieces of music, a really cool amalgam of metal, fusion and indy rock. This was a pretty straightforward version, which is to say, awesome. "Nemo" really shows off the band's pop-rock sensibilities, stripped of the prog and heavy metal influence that marks so much of their material. It has a seductive melody that is suggestive of Dave Matthews Band (but more rocking), and it might just be their most radio-friendly song. This version featured an "Earth Hour" jam in recognition of the globally recognized event to turn off non-essential electric devices to raise awareness of global warming and the need for energy conservation. Instead of an "Earth Hour", however, the band played a mellow "Earth Minute" jam with all the stage lights turned off. This jam was nothing like a typical "Nemo" jam, but it built with intertwining guitar leads to a typically explosive crescendo...and then a super-tight stop-on-a-dime...a 2-second pause...and right back into that catchy "Nemo" guitar riff that gets stuck in your head for days. No matter how much these guys like to explore, they do like things to be resolved. The instrumental Professor Wormbog was up next. While most of their vocal songs fall into some kind of prog-rock category, most of their instrumentals venture into other musical styles, and Professor Wormbog is no exception, with its muscular funk-rock and jazzy piano interludes. This version featured a short vocal bridge - "Zoom zoom zoom zaya...", etc - set to the melody of one of the vocal bridges in, of all things, Boyz II Men's "Motownphilly"! The slow-burning guitar improv that emerged from the bridge was all Umphrey's, though, and the jam peaked superbly before dropping back into the super-tight funk to close it out. Next up was Spires, a dark dirge from the new "Mantis" album, reminiscent of the grunge of Pearl Jam and Alice in Chains. Powerful heavy metal riffs gave way to hard-hitting prog in this succinct track. They left off the usual melancholy ending to Spires, and instead dropped seamlessly from grungey power chords into the smooth and loungey sounding techno-house grooves of the instrumental "The Triple Wide", a Joel Cummins number that featured him working the crowd into a hot and sweaty dancing frenzy with some wild and crazy moog-soloing to close out the first set. The second set opened with "Turn and Run", another grunge-influenced number from the new "Mantis" album. The brooding but catchy melody really grows on you, and this song features a couple of nice twists and turns, including a head-banging moog solo. Finally Jake sent it off with a scorching solo that seemed to channel Eddie Van Halen at his finest (and I mean that in the best possible way...and I'm not referring to that finger-tapping thing he does). Next it was time to delve back into some epic prog-rock, and "Bridgeless" was just what the doctor ordered. This turned out to be a massive version of "Bridgeless", sandwiched around a cover of the early 80's hit from The Who, "Eminence Front". "Bridgeless" opened with its complex, classical guitar prog passage, reminiscent of early 70's Yes, before settling into the driving, mechanical-sounding guitar chords that define the song's lyrical verses. After some more soaring prog-classical excursions, Joel devolved the chord structure of the song into a repetitive keyboard progression that eventually morphed into the signature looping piano refrain of "Eminence Front". This was a big surprise for us, since we'd never heard of them playing anything by the Who before...but then again, Umphrey's has been known to bust out a wide range of classic rock covers, from Steely Dan to Smashing Pumpkins to Paul McCartney and Wings. Jake took the lead in this song, convincingly singing Pete Townsend's vocal parts ("It's a put-on!!") with a passion, and then delivering an absolutely blistering Townsend-influenced guitar solo. Eventually, the repetitive guitar refrain of Eminence Front morphed back into more familiar territory, and the mechanical guitar chords and final verse of "Bridgeless" reprised even as Joel continued the timeless keyboard part from "Eminince Front". Finally, after yet another flight of classical-prog fancy, a frenetic improv developed into one of Jake and Brendan's signature guitar duels that upped the ante higher and higher to an absolutely explosive crescendo. Wow!! After that section of the show, we just stood there looking at each other with eyes bulging, shaking our heads in disbelief. They really needed to cool things off a little bit after that, and "August" was a nice choice. Another mid-tempo radio-friendly number, this one has more of a heartland, Midwest hippie-rock sort of feel to it, heavy on the African percussion and gentle guitar tones. Nevertheless, for this performance, the band devolved the middle section into a mechanical-sounding arpeggio'd progression that quickly bore absolutely no resemblance to the song. This riff wound itself through various tempo changes and textures and up and down several crescendos, until suddenly they took a sharp left turn and bam!...we were right back into the yearning optimism of "August". Once again they had transformed a familiar chestnut into something completely unrecognizable and back again, all with a nifty cleverness and creativity far beyond the average jamband. As we moved deep into the second set, the prog-heavy "Search 4" made a welcome appearance. Darkness ensued as the band channeled equal parts Tool and King Crimson through a complicated syncopation of classical piano and pounding metal riffs, overlayed with a sulky melody. Yet another ravaging guitar climax had us wondering if these guys could ever get worn out! The party really got rolling with the off-beat funkiness of "The Fuzz", a song from the band's early repertoire that featured Kris on the tongue-in-cheek R&B falsetto vocals and Ryan with the rubber effect on the bass (a la Bootsy Collins). Not surprisingly, "The Fuzz" morphed seamlessly into the P-Funkiness of the party instrumental "Soul Food II" that had the crowd yelling out, "We want the Umph! Gotta have that Umph!" to the melody of the famous Parliament Funkadelic song. The funk went on just long enough to get things really moving on the dance floor, and then they started speeding up the funk rhythm like a wind-up toy until BAM!...the slamming intro to "Got Your Milk (Right Here)" a hilarious song with Frank Zappa-style sarcastic lyrics, set to a balls-to-the-wall fusion of upbeat, melodic post-punk riff-rocking and ska. With Jake and Joel trading off lyrics like "She is searching for her cellular phone"..."She wants to call her Daddy! ", this was a fun way to close out a tremendous second set. The encore brought us the second cover of the night, a super-tight rendition of Rush's archetypal instrumental "YYZ" that Umphrey's has played in concert dozens of times. As usual they finished "YYZ" with the final 10 seconds of "The Spirit of Radio" (another Rush classic), and then took yet another crazy left turn, as from within the crashing final chord of the Rush cover emerged the familiar vocal melody of "All in Time", the song they'd left unfinished at the beginning of the 1st set. The reprise was no throway, either, with another strong jam that built from a reggae-tinged whisper into yet another frenzied crescendo. Are these guys aliens?! 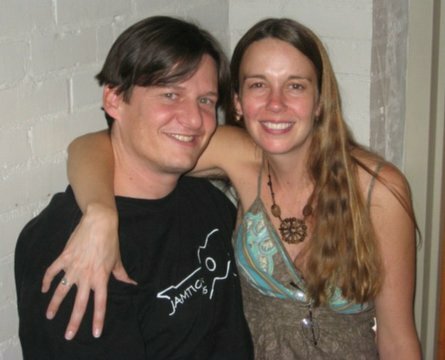 In our crew of four, three of us (Paul, Carley and Rob) were already fans of the band and had heard them dozens of times. Nevertheless, all three of us were blown away to a whole new level by this show. As for the other member of our crew, James had seen them at a festival once before, but he was far more impressed with them this time around. Lucky for us, Umphrey's is coming back through our area in less than six weeks. On Saturday, May 2, they'll play even closer to our house, only 45 minutes away at the Lyric Theatre in Oxford. You know where we'll be! 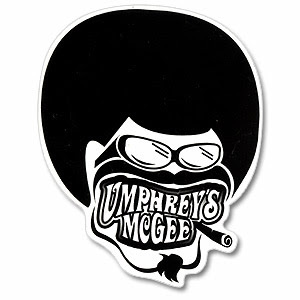 Check out the Umphrey's McGee show we saw in Live Oak, Florida, on 11/18/2007.